You are most welcome to (re)join us! 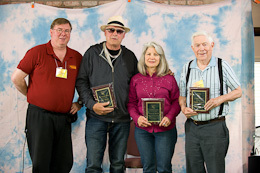 The California Autoharp Gathering may be the “Biggest Little Festival in the World.” Unless you have participated with the CAG in past years, it is hard to describe the sense of magic that occurs. For a few days, participants take their busy and complicated lives and put that aside to focus on the joy and spirit of music and the arts. It is a method where people fully participate in this approach, too. When you combine an absolutely beautiful setting like the St. Nicholas Ranch, with the finest autoharp and music performers and teachers, along with good food in surroundings, then this sense of magic appears. It is really an incredible weekend. Everyone is welcome, regardless of skill or background in music. I would especially like to invite new or beginning musicians to our event. Many folks have a great background in music – with or without formal experience or lessons – but also have a sense of music that is part of the human soul. The autoharp is an outstanding musical instrument to bring your music out into the world. The autoharp is a relatively easy instrument to learn to play. Most folks can have success in performing songs and tunes within the first hour of instruction. Before you know it, you will be able to play all of those great songs and tunes that you grew up with. There are no judgments on skills level here at the California Autoharp Gathering. Everyone is invited to play and learn and enjoy themselves. It simply does not matter how “good” you might be in performing music. If you enjoy it, then we’ll all enjoy it, too. 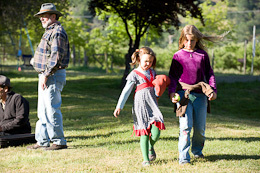 You will feel safe and secure with some of the finest and down-home participants in the world. Most people get to be pretty good on the autoharp. It is a tremendous sense of feeling and accomplishment when you can play a song. That is what we have here at the CAG – an environment where you can come and really have fun with music – both as a learner and a performer. To bring music, dance and arts to all participants – adults and children alike. It is important to introduce and encourage young students to participate in the world of fine arts. We bring children closer to those skills with hands-on workshops; both with their own specially designed classes and in classes with adults. Children will also have the opportunity to perform and showcase their own skills. To promote traditional music with the autoharp. The autoharp is a wonderful instrument for beginning musicians, regardless of age, background, or experience. All participants will be encouraged to learn and enjoy creating music. 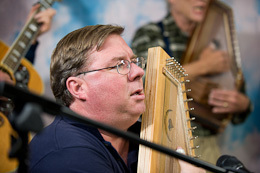 Although the autoharp is our primary instrument, we welcome all acoustic instruments at the CAG. To bring world-class artists to entertain and teach participants with concerts, workshops, and friendships. Both staff members and participants work closely together with spirit and enthusiasm. Everyone has fun! 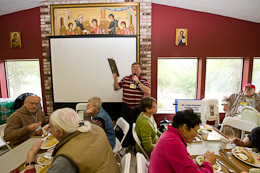 To enjoy the beautiful Sierra Nevada Mountains at the scenic St. Nicholas Ranch. It is a chance to recharge your energy, relax when you like, and jump in the middle when you wish! To have a great time with memories with friends, family members, and fellow musicians that last a lifetime. 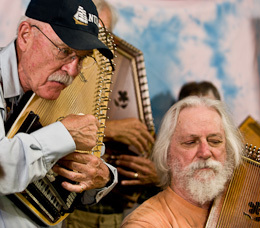 There will be opportunities for you to share music, meals, memories, and more with some of the world’s leading renowned autoharp and folk artists. If you have any questions or comments, I am more than happy to assist. Please use the “Contact Us” webpage and I will respond as soon as I can. You may also contact me at: (559) 994-8215 by telephone. Please use our Online Credit Card Registration Form to reserve your spot with the California Autoharp Gathering. Then get tuned and ready for one of the most memorable weekends of your life!